Thyroid, Parathyroid, Adrenal, Endocrine Surgery, What is a Retrosternal (sub-sternal) Goitre? A retrosternal goitre occurs when the thyroid enlarges downwards into the chest.Although the great majority of retrosternal goitres are extensions from the neck, pure intrathoracic goitres do occur. 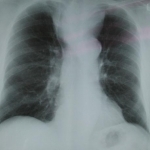 Retrosternal goitres are more likely to be left sided.Very rarely a left sided cervical goitre descends into the right side of the chest this is called a "crossed substernal goitre". In endemic goitre areas 20%of the population over 70 years old will have a retrosternal goitre. The definition of a retrosternal goitre varies with respective authors, there are four major definitions. #4.Goldenburg and co-worker as early as 1957 defined a retrosternal goitre as one reaching the level of the fourth thoracic vertebra. The generally accepted definition is the one by Candela.The natural history of retrosternal goitre is of a slow relentless increase in size,often presenting as an incidental finding on a chest xray in the fifth or sixth decade of life. The commonest symptom is a feeling of pressure. The management of a retrosternal goitre associated with airway obstuction,swallowing problems or major obstruction of arteries or veins is surgical and is not controversial. Any suspicion of malignancy is an absolute indication for surgery. The operation of choice is usually a total thyroidectomy hence reducing to zero the need for secondary surgery due to regrowth of retained thyroid tissue.In symptomatic patients 29% will insist their symptoms have not been improved by surgery! The correct management of asymptomatic retrosternal goiters is unclear and very controversial. There are two schools of thought.The conservative surgical group argues that the incidence of cancer is no higher than cervical goitres ( a maximum of 3.7 new cases per 1000) and this risk is not in the uncomplicated case an indication for surgery. The conservative surgeon also points out that a study in New York State of over a thousand operations for retrosternal goitre demonstrated a 14 fold mortality as compared to that in cervical goitre and a significantly greater risk of damage to the parathyroids,recurrent laryngeal nerve and of major bleeding. In contrast the aggressive surgical group state that all patients without medical co-morbidity with an asymptomatic retrosternal goitre should be operated on! They reason that although the risk of cancer is no higher than patients with cervical goiters that the actual diagnosis of thyroid cancer is often compromised since needle biopsy of the retrosternal goiter is often difficult if not impossible.The aggressive surgical group also state that 5-11% of retrosternal goitres will present at some time with acute airways obstruction and prevention of this dreaded complication is better than an attempted cure. The aggressive surgeons emphasise that advancing age is associatedwith an increased co-morbibity suggesting that early surgery is associated with reduced risk of complications. There are no controlled trials of the management of asymptomatic retrosternal goitre. Mr Lynn's approach to the asymptomatic retrosternal goitre is very much a halfway house of the apposing views. Mr Lynn has never had a death from surgery for a retrosternal goitre. Using intra-operative nerve monitoring and the "toboggan technique"of the charismatic late French surgeon Charles Proye he is convinced that in his hands retrosternal goitre has a no higher incidence of nerve damage than cervical goitre.Likewise the damage rate to the parathyroids using intra-operative parathyroid hormone measurement and where necessary parathyroid autotransplantation is most likely not significantly higher than for cervical goitres. Mr Lynn is very cynical about the term "asymptomatic retrosternal goitre". On careful questioning some patients previously diagnosed as having symptoms unrelated to their thyroid do have symptoms that will respond to well to thyroidectomy. Mr Lynn's cynicism is borne out by a study from Melbourne Australia that confirmed that only 16.6% of retrosternal goitres were asymptomatic.In the past too much reliance has been placed on the structural impact of the retrosternal goitre and not enough on its physiological effect. All patients in whom there is the suggestion of compromise of the trachea or bronchi by a retrosternal goitre should have a physiological flow volume loop performed so as to differentiate long standing asthma from upper airways obstuction due to a retrosternal goitre. One is often suprised by the fact that gross displacement of the trachea may have little effect on the flow loop while in contrast minor tracheal deformity may result in significant changes. What does this all add up to in Mr Lynn's view.? First,in fit patients with physiological evidence of airways obstruction, surgery is indicated and is very safe. Any hint of malignancy justifies surgery remembering that it no more common than in cervical goitre. Second, if a decision is taken to watch a retrosternal goitre then progressive enlargement on serial CT scans is in Mr Lynn's view an indication for surgery. Third, the elderly patient with a stable retrosternal gotre can be watced as long as his or her flow volume loop does not show a significant compromise. The observed patient can reassured that there is at the moment there is absolutely no evidence to suggest that an uncomplicated retrosternal goitre behaves in any way differently from an uncomplicated cervical goitre were a wait and watch policy is the international standard. What factors will help the patient make the correct management decision ? First make sure that the surgeon has a very high yearly volume of thyroid surgery.Expect your surgeon to do at least 100 cervical thyroids a year if he is to have any significant experience of retrosternal goitres. Splitting the breast bone or removal of the inner part of the collar bone is rarely needed in retrosternal goitre (1-2% of cases). Ask if the surgeon does this himself or with the help of a thoracic surgeon. Very experienced thyroid surgeons like Mr Lynn usually do the whole operation themselves. Thyroxine treatment in euthyroid (normal thyroid function) patients with large goitres is as hopeless in reducing the size of a huge retrosternal goitre as King Canute was at controlling the tides. Radioactive Iodine is useful and fears of increasing any element airways obstruction have been allayed by an Australian study in 1997.The Australian workers demonstrated in large multinodular goitres a 71% subjective improvement in compressive symptoms and in 92% a clinical assessed reduction in goitre size after using oral iodine-131 therapy. They used 2.22 GBq (60 mCi) as a cumulative dose 4 over months (555MBq per month).Not all the patients in this study had retrosternal goitres.Previous suggestions that radioactive iodine may precitate repiratory distress in toxic elderly patients is most likely not valid. Radioactive iodine in most physicians experience rarely results in a complete resolution of the goitre and is tedious,often needing several doses. It may be more beneficial than previously thought and should therefore be discussed as a possible option in the treatment of retrosternal goitre.